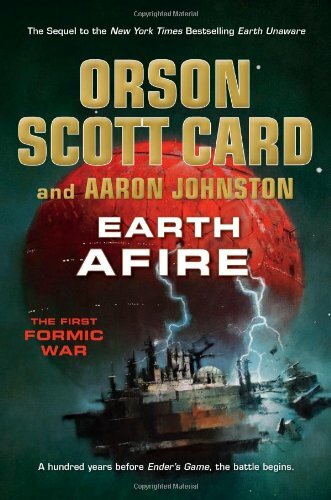 Earth Afire is the second installment in the Formic Wars novels, which are prequel novels to the Ender Game saga. Long before Battle School was built and Ender Wiggin was born, the Formics came to Earth and nearly wiped us out. In Ender’s Game we hear about events of the war — The Battle of the Belt or The Scouring of China. But that’s all we know: that such events occurred. In Earth Afire, those events come to life, and we begin to see where the idea of child commanders was born. I have always been fascinated with the character of Mazer Rackham. In Ender’s Game he’s somewhat of a mystery, a wise old master with a heroic past and a brilliant mind. But it’s not until Orson Scott Card’s short story Mazer in Prison that we first glimpse who this man really is. Earth Afire tells the story of the young Mazer Rackham, a lieutenant with the New Zealand Special Air Service who gets caught up in the war and who is profoundly changed because of it. We know he survives of course — he must in order to assist Ender Wiggin in the future. But surviving, Mazer learns, can be a lot more painful than dying. Also, we continue to follow Victor Delgado, Imala Bootstamp, the survivors of El Cavador, and Captain Wit O’Toole. Here’s the official book jacket copy.